The Kenyan El Classico aka Mashemeji derby is here yet again as Kogalo face Ingwe this Sunday. This could not have come at a worse time for Gor Mahia as the club has lost 5 straight games without scoring. Nevertheless, most fans saw some light at the end of the tunnel given how well the team played in the first half of their midweek match against defending champions Tusker. The effort was there. There was better coordination. But yet again the club’s biggest achilles heel which is scoring was yet again in evidence. Not only the like of striking power but the inability of the playmakers to create clear cut chances. “We had a great first half but failed to convert our chances” said coach JBO after the game. Also Gor Mahia does not seem to have any goal poachers who can score from half chances or simply poach a goal even against the run of play. Still the Kenyan El Classico does not respect current form. Just last year, Kogalo were in a major slump that saw the departure of coach Zico. Yet they pulled themselves out of the ashes to beat Ingwe in the FKL cup final. And this has rung true for years. In 1991 Gor Mahia won the league handily with a superior team that had players like Felix Otieno, Allan Odhiambo, Jared Achieng, Tom Odhiambo etc. When playing against AFC, they flat out dominated and outplayed them. Felix Otieno in midfield looked like he had no peers. Yet AFC won on both occasions. They created one chance and used it. And of course current coach Bobby Ogolla was the pillar of the defence in 1984 when Gor Mahia was high flying, scoring 80 plus goals in the league, winning by a huge margin, completely outplaying AFC, yet loosing 3 straight times to Ingwe. Based on the evidence of this week’s game, Gor Mahia are slowly emerging out of their slump. They will have worked hard on their weaknesses upfront. “The lack of goals is of particular concern and we have to work on our attack before facing AFC” said coach Bobby this week. Another area of concern is the defensive lapses. Ferroviario must have studied tapes of the club and saw ways to capitalize. Its interesting that on both occasions, their midfielder who has a rocket of a shot was given free space by Kogalo defensive midfielders and allowed to shoot against the hapless Jerim Onyango who never stood a chance. We all know that Dutch coach Jan Koops wil have studied these weaknesses and come up with ways to exploit them. One should hope that the technical stuff will have plugged the holes by Sunday. Bobby Ogolla has called upon fans to help lift the morale of the players by cheering them. “No one should judge us based on the most recent results” said Bobby this week. It is commendable that on Wednesday , many fans continued to cheer the team even when they went down 2-0. The playing unit will need this kind of support as they try to dig themselves out the current slump. So let the 12th man turn up in large numbers and cheer because you know AFC fans will turn out in droves. yes its time to rally behind our beloved mahia, almost everybody have ruled us out and this is ok because after match we will be celebrating for our victory,may God bless K’ogalo family. Well, it will not be that easy to beat AFC on sunday letS be realistic, and i hope we win but a draw will be better than a loss. I think it will take us about another 3 or 4 games before we can start winning on a regular basis.we dont have goal scorers at gor Afc has 3 of them wanga,baraza and victor ochieng. Our back line is not that good same as Afc back line but Afc have only conceded 1 goal while we have conceded 8. These are facts. I hope we Draw on sunday. a win will be iceing on the cake. We’ll bounce back in style lets motivate our players n thats the true spirit of Kogallo folower Gud luck. Go Gor!, Go Gor! !, Go Gor!!! Go! Go! Go! Gor that is my rallying call I know when the time comes when we will rise, the others will bow down to our MIGHTINESS! I stongly believe that we are coming out of the Ashes and once we hit top form,we will be unstoppable. Ingwe are in a teriffic form lets not console ourselves,there is no way Kogalo can win this one lets just hope that atleast we will score a goal coz at the moment scoring is what we need and loose like 3-2/4-1 you know …….. its more reasonable that way i have watched kogalo play and i tell you they are down,almost hopeless.for club and country. Just asking players to go and play without motivation is dumb. We all know what Leopards’ sponsors, Chairman and fans have promised their players in case of a win or draw. On our part we are just quiet with no plans. Someone said they give us Mpesa number we contribute. No one is saying a thing or leading from the front esp from the EC. Can imagine how Leopards players are motivated. I wish Mapunda was keeping the posts. As much as we rallying behind this team this time around am VERY AFRAID. @7 Paw and @8 Eblazing you guys sound very symphathic and well beaten to the level that you are down on your knee’s even before the kick off whistle; YAWA…!!! my comrades. This is a local “EL CLASSICO” currently very famous as “The Mashemeji ” derby where anything can happen irrespective of the prevailing statistics and as such let us wait for the 90 minutes on the D_DAY . NATION AT THIS POINT IN TIME.WHEN WE NEED TO BE ENCOURAGING ONE ANOTHER AS THE REAL LOYAL FANS AND DIE HARD GOR MAHIAN’S. I have consulted widely regarding the GOR Vs AFC derby with JO DON’G PINY and my friends from JO-NDHIWA and when I read in between the world view and the prevailing mood in both camps, then there is a strong feeling amongst the veterans like Joe Kandege and Micky Weche inclusive of their own “White Withch Doctor” namely “Wepekhulu” none another Koops the muzungu that GOR is there destroyer in waiting. ITS ALL SYSTEM GO and the SPIRITS of GOR MAHONO ARE VERY MUCH OMNI-PRESENT TO CREATE THE AWE-INSIPIRING EXPERIENCE THAT WILL TAME THE LEOPARD FOR K’OGALO TO CARRY THE DAY TRIUMPHANTLY. We want lavatsa! He should atleast play in this match. Midenyo, abondo should be benched. Ngwa shld partner lavatsa upfront coz we nid goals on sunday! Thank you @Ogango Trailer in post 9. So what if ingwe is on fire. Do they have monopoly rights over that fire? Gor Mahia is playing attractive and entertaining football now and I will be at Nyayo to shout and sing my voice hoarse as I cheer this great brand of football. The last thing that worries me now is the result of the match. Gor will always be Mighty Gor in our hearts, goals or no goals; victory or loss. Guys as proposed, we meet for prayers at St. Stephen’s Jogoo road after which our grand march proceeds to Nyayo stadium. To Ticket masters: we anticipate gate collections to the tune of KES 5,750,000.
please let those pessimists continue with their evil wishes for GM as far as i’m concerned,we’ll get positive result in the derby. We are winning this.Everything from okoth jabilos’ crystal ball to ‘wephukulus’ worry of his team being overconfident hence complacent tommorow points to a gor win.To yee men of little faith(@2,motema pembe and @7,paw)This is a derby.Derbies are not dictated by formbook,statistics or even facts! A derby has its’ own mysterious rules which no one understands.Wait until after the match tomorrow,and you’ll understand what am trying to say. @14 Keep dreaming, Gor will not beat Afc. we dont have goal scorers even a penalty taker. Have just bought ticket from Kenya Cinema.what make me laugh,the AFC fans r sure with KOGALO that they shall have easy point tommorrow may i wish them luck but they should not cry after 90 min.to KOGALO fans we turn in our usual style to cheer our BOYZ. To our beloved fans,morrow we meet at St Stephen’s Church hope the last match then we proceed in style.am a Catholic by faith en tommorrow wl be at St.Stephen.we turn in large as usual. All the best Kogalo… Form is temporary, Class is permanent. All the best Kogalo… Form is temporary, Class is permanent!! We meet again for the first time this season to continue our rivalry both on and off the field of play. Like the past derbies, this one will also be fireworks. I agree totally with comrade bloggers who earlier said such derbies has no definate rules. infact the results can go either way. 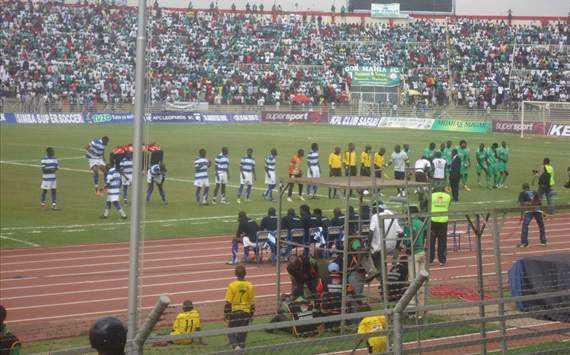 To Ingwe, we always feel honored to play against you. The two great clubs share historical and strong cultural ties that have gone on for years. On a personal note, I have all along admired this symbiotic relationship these two clubs share. I am already excited and can’t write any more. See you all at Nyayo kesho. Go, Go K’ogalo, please focus n get goals, the stakes are just too high, we luv u guys….!! D’ont be intimidated, u r just too mighty!!! For the fans, support please n be patient with the boys, there is always life after the game. Encourage the boys to tame the LEOPARDS n blunt their claws b4 getting them back to their usual long balls….!!! Ogango @ 10, don trivialise this blog. On my part I questioned the motivation gear to our players. Is there something wrong motivating our players? Don think only positive vibes like yours are the only ones making of a team. If you feel asking for a little incentive to the tech and players is too much to you no one is forcing you. And we are equals here. You got no special right to ask Admin to gag positive criticism. Don be archaic!